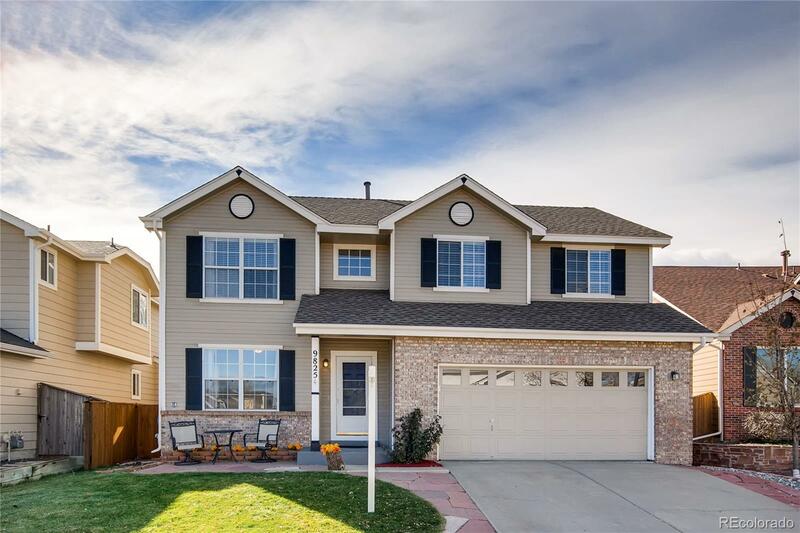 Celebrate the Holidays in this beautiful Highlands Ranch home! Vaulted ceilings, open floor plan & gleaming, dark stained wood flooring throughout main level with popular laminate wood upstairs. Upgraded kitchen with stainless steel appliances, granite counters, glass subway tile, walk-in pantry & kitchen island. Private master suite features spa-like bath with walk-in shower & soaking tub. The family room is a perfect gathering place as it opens to the kitchen & out to the deck with party lights on the pergola & fenced backyard. Main floor laundry & mud room! Fully finished basement is perfect for media or play room. Don't miss the extra bedroom & bath in the basement. Professionally landscaped yard with sprinklers & drip system. Location is prime with great amenities nearby; 4 top rated Rec Centers, extensive trail system, great schools & nearby amenities. Minutes to Chatfield State Park w/ easy access to the foothills & Colorado's mountain towns! Come HOME for the Holidays!